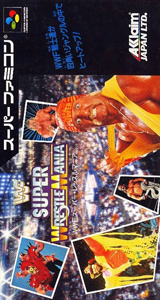 WWF Super Wrestlemania for Super Nintendo allows you to choose from: Hulk Hogan, Macho Man Randy Savage, Earthquake, Typhoon, Sid Justice, Jake "The Snake" Roberts, Ted Dibiase, The Undertaker, Hawk, and Animal. 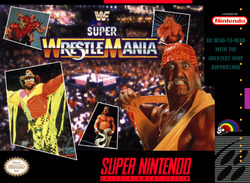 Enter the ring in singles and tag team action. However, there is no guarantee that the action will stay in the ring. If you want to dish out lots of punishment, go through the four-on-four survivor series. For 1-2 players.